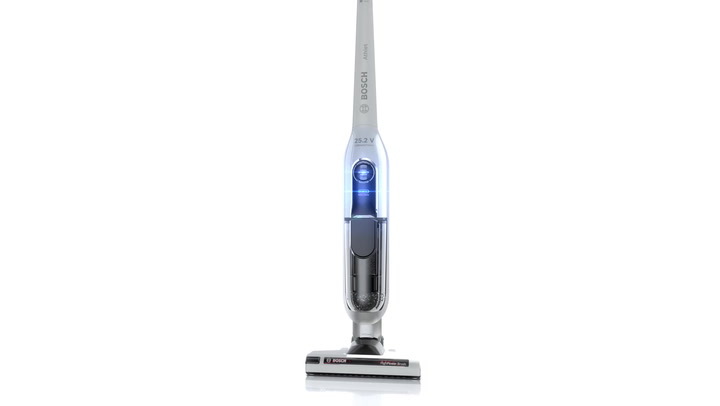 Save R400 on the Bosch Athlet Slim Cordless Bagless Upright Vacuum Cleaner. While stocks last. View more from Vacuum Cleaners, Bosch. We love our new Cordless vacuum - it doesn't make a noise, easy operation and great cleaning. I would not however recommend - specifically because you do not get any attachments (e.g. hoses to get into those small places or even to vacuum under lounge suite cushions). When I ordered this vacuum - I honestly didn't even think to check if these would be included. As far as I'm concerned, these attachments should automatically be included when buying a vacuum. I contacted Yuppiechef to find out if I can order the these 'additional' accessories - I was informed that this is not possible as Yuppiechef is not an agent of Bosch. Although expensive, this vacuum cleaner is super convenient and easy to use, with its cordless and bagless system. It has a long battery life. Makes those quick clean-ups a real pleasure. I always delegated the vacuuming to my adult children and I did the rest.... now... it is such a pleasure to do it. No cords catching on everything and searching for plugs behind bedside tables etc. I love it. The only thing I would have liked would be to vacuum the sofa but there is no attachment for this. I would certainly recommend it. Love that it is so light and not loud at all! My first upright vacuum, and where have you been all my life? ;-) No more pulling something that gets stuck behind a chair. Powerful as well. Only con would be that you need to remember to recharge it after every use.